Happy Friday, everyone! It has been a hectic week between client meetings, getting ready for the holidays, and my mom being in the hospital since Monday. Between all of that and the cold weather, all I want to do this weekend is hang out at home. This room, featured in the January 2014 issue of Canadian House & Home seems like the perfect setting to do just that. 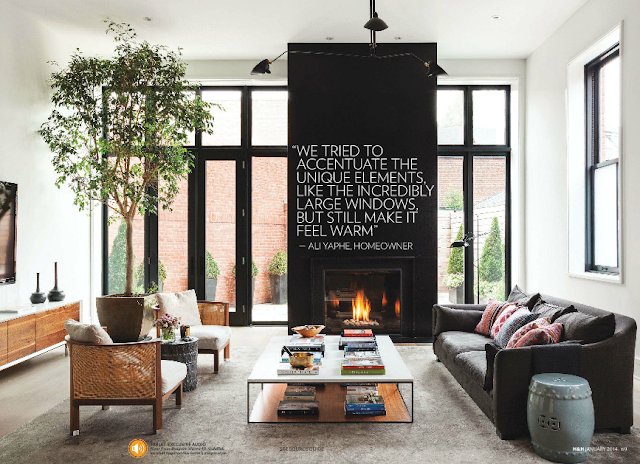 The bones of the space are sleek, modern, and minimal, but it feels completely warm and inviting because Ali Yaphe, the homeowner, did such a great job with the scale of the furnishings she selected as well as the mixture of textures. The rug and sofa, and wood pieces add warmth, while the 13 foot ficus tree adds a pop of color and a natural element to a space that in its raw state could have felt cold and empty. I love the black framed windows and doors and the fact that the tall fireplace is painted black. It becomes such a distinguishing feature in the room. One of my favorite elements is the Serge Mouille light fixture. It is huge, but the scale is absolute perfection in this room. What is your favorite thing about this room? My favorite element is the light fixture too...followed by the ficus tree and the fireplace. Sorry to hear about your Momma! Hope she feels better soon.